Eliminating cash bail has become a focal point in the fight to transform the criminal justice system. Inside the wins and challenges of a growing movement that raises money to free people of color who are in jail simply because they can't afford to post bail. Two women who were bailed out of Pinellas County Jail in Clearwater, Florida, by Dream Defenders speak to a reporter during the May 11, 2017 National Bail Out action to get them released in time for Mother's Day. Ebony* had been in an Atlanta jail for two weeks when one May evening, just before Mother’s Day, she got an unexpected visit from an attorney with good news: Someone had found her name through an open records request and wanted to pay the $1,000 bail that was keeping her locked up until a court date for driving with an expired license. While she was out on bail, the 45-year-old mother and grandmother went to court and paid the $250 fine for a delay in addressing a three-year-old ticket. 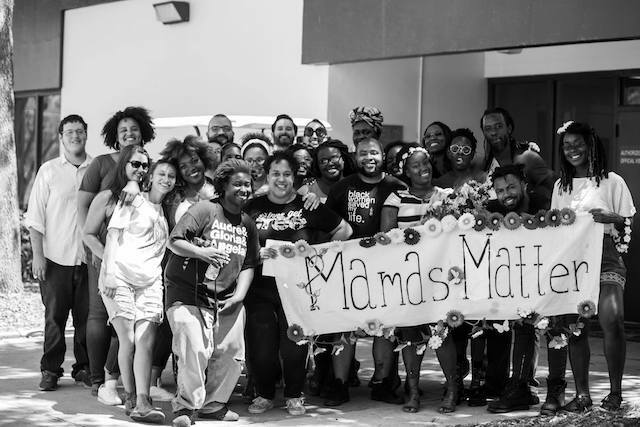 Though it may have seemed a random stroke of good luck to those on the receiving end, the Mama’s Day Bailout was the product of careful, strategic planning on the part of organizations such as Southerners On New Ground (SONG), which coordinated the Atlanta bail out, and other social justice organizations nationwide including Essie Justice Group in California and Texas Organizing Project. These groups covered bail for 120 people in May and another three dozen in June and July timed to events such as Father’s Day, Juneteenth and Pride. The campaign, fueled by the Movement for Black Lives [PDF] raised more than $1 million for the direct actions and brought new energy to the decades-old struggle to end cash bail. In August, SONG bailed out 36 Black people across the South, and a spokesperson there said the group expects actions to continue this week in Richmond and New Orleans. The highly publicized deaths of Kalief Browder in New York and Sandra Bland in Texas illustrated that while the disruptions caused by pretrial detention most often cost low-income people their jobs, homes or relationships, it can also cost them their lives. Tragic stories such as these have helped steer the national conversation and bolstered the case for ending bail. Photo: Christy Marie/Christy Marie Photography A woman exits Pinellas County Jail during the National Bail Out action on May 11, 2017. Thomas Harvey, who directs the non-profit law firm ArchCity Defenders, is challenging the interrelated system of bail and traffic fines and fees that put people behind bars—what he calls the criminalization of poverty and race—through a series of lawsuits in St. Louis County, Missouri. Just fewer than 1 million people live in the county’s 90 towns, 81 of which have their own police forces and part-time courts. Harvey and his colleagues have sued 30 of those towns, including Ferguson, using class action suits to challenge their use of bail and their operation of what Harvey calls debtors’ prisons. “At least in the St. Louis region, it’s poor folks and communities of color that are being held on cash bail,” Harvey says. “Courts are quicker to impose these onerous consequences on them.” (This is true nationwide as well. Black Americans are 2.5 times more likely to be arrested and almost four times more likely [PDF] to be jailed than White Americans. Harvey’s group has reached settlements with the cities of Jennings, Velda City and St. Ann. Last year, Jennings agreed to pay $4.7 million in compensation to people detained for court debts and also signed on to a set of reforms including ending cash bail in favor of releasing those accused of nonviolent offenses on their own recognizance. Under the new system, the court employs a five-step process before issuing a warrant for someone’s arrest for failure to appear in court, Harvey says. These wins and others like them in recent years have occurred in small municipalities throughout the Midwest and South, where there’s often a lack of training and professionalism on the part of court officials, says Harvey. Attorneys involved in these cases and specializing in bail reform litigation, such as those at Civil Rights Corps and Equal Justice Under Law, are now taking on big cities, including Houston and Chicago. State legislators pushing for reform also point to New Jersey and Washington, D.C., which has long deprioritized cash bail. California State Sen. Robert Hertzberg, who co-authored [[a bail reform bill now moving through that state’s legislature used New Jersey’s numbers to make his case during a July 11 committee hearing. That day, various state and national social justice organizations showed their support for SB 10, including representatives from Lawyers Committee for Civil Rights, SEIU, Legal Services for Prisoners with Children, Courage Campaign and the ACLU of California. When it came time for the opposition to speak, one bail bonds agent after another expressed their disapproval. “I will be chasing fugitives for ever and ever, amen,” promised someone from Lipstick Bail Bonds. “There’s no need to eliminate the bail industry,” another bail agent said. A desire to expose the industry’s coordinated effort to kill reform led Color Of Change and the ACLU to release “Selling Off Our Freedom” [PDF] earlier this year. The report challenges the $2 billion bail industry’s practice of charging a nonrefundable fee (typically 10 percent) in exchange for posting bail for someone accused of a crime. It also highlights that the U.S. and the Philippines are the only countries that allow for-profit companies to play a role in decisions regarding pretrial release. The practice may be uniquely mercenary compared to the rest of the globe, but Color Of Change’s Roberts has found that likely allies in the fight to end bail have been slow to hold the industry accountable. “Even in our own communities, bail bondsmen have a reputation of being someone who’s helpful,” he said. The buzz around bail, from conversations about it in Southern Black Baptist churches to campaigns to free Black mothers, might indicate that this is a new movement. But the fight dates back five decades to Attorney General Robert Kennedy’s convening of the first-ever National Conference on Bail and Criminal Justice in 1964 and the passage of the Bail Reform Act two years later, which expanded the practice of releasing defendants on their own recognizance. Burdeen of the Pretrial Justice Institute said we’re now in the third generation of bail reform, the start of which she places in 2011 when Attorney General Eric Holder addressed the National Symposium on Pretrial Justice and expressed his support for jurisdictions seeking alternatives to bail. Burdeen, whose organization serves as a clearinghouse for advocates, legislators and litigators working on reform, said what’s new about this moment is the pressure activists are putting on legislators and the criminal justice establishment to make change. “This wave of reform is really an uptick in activity among the general public and the advocacy community,” she said. The election of Donald Trump has done little to dampen this activity. If anything, it’s invigorated the movement and emboldened state and local elected officials to continue down a path of reform, according to advocates I spoke with. And while Holder used his platform to encourage change, the Department of Justice didn’t devote the resources jurisdictions need to make real change. That’s where philanthropy has stepped in. Photo: Christy Marie/Christy Marie Photography Activists who participated in the National Bail Out on May 11, 2017 gather in Clearwater, Florida. Last year, the MacArthur Foundation awarded nearly $25 million to 20 jurisdictions working on reducing their jail populations. Philadelphia, which has the highest incarceration rate of any big city nationwide, received $3.5 million to support reform. A portion of those funds is being used to develop a predictive risk algorithm to help judges decide who should be detained pretrial and who poses no real threat to the community and so should be released. Such risk assessment tools – often described as “data-driven” or “evidence-based” by their proponents—have been a key factor in bail reform in New Jersey, Kentucky, Arizona and in dozens of counties nationwide. The tools comb administrative records to determine a defendant’s likelihood to be rearrested or to fail to reappear for a court date. They collect data such as age at first arrest, whether a person has prior misdemeanor or felony convictions, a history of drug abuse or has been incarcerated previously. But a focus on these aspects of someone’s life has the potential to replicate the same problems we currently see with cash bail, some advocates said. Namely, it will unnecessarily keep a disproportionate number of Black people behind bars. This is Philadelphia organizer Josh Glenn’s concern. Reliance on algorithms overlooks racism embedded in police practice and the criminal justice system more broadly, he said, echoing the findings of recent reporting and research. The 29-year-old said he’s been stopped and frisked more than 1,000 times, and that’s because he grew up Black and poor in aggressively policed West Philadelphia, not because he’s a criminal. His emphasis on understanding and meeting a defendant’s needs came up again and again during conversations with activists pushing to end cash bail. Many speak of shifting the frame from “risk assessment” to “needs assessment” in order to appropriately deal with questions of recidivism and alternatives to jail. In a collectively authored document that SONG sent to its network titled, “10 Lessons Learned From the Black Mamas Bail Out Actions,” members who participated in bailouts wrote: “Locally, our crews were not prepared nor had the relationships in place to connect those we were bailing out to all they immediately needed… In this action, some of our most heartbreaking moments were women telling us that staying in jail was their only survivable option versus dying on the outside.” From Georgia, to Florida and Texas, organizers who led actions are now helping those who have been bailed out find housing, drug treatment programs and other services, says Mary Hooks, who directs SONG and was an architect of the Mother’s Day campaign. Dani McClain reports on race, reproductive health, policy and politics. She is a fellow with The Nation Institute and a contributing writer at The Nation.